The goal for Projectmates is to be both intuitive and a platform you are already familiar with. Add to that the mobility aspect and availability on phones and tablets and you have a quick and easy solution to manage your capital projects as well as streamlining your cloud based project management software. The reporting function was a big challenge that we overcame with Projectmates. There are a lot of executives and different leaders who rely on the weekly report that is automatically sent out. It's become a part of the way we do things." — Tova Vance, Construction & Design Manager with U.S. Cellular. The second feature to look for when finding a better way to manage construction is to look at bid management. Gone are the days of having to sort, classify, level and compare bids from separate entities. With Projectmates, the bids are simple with line items and a 4 step process to publish bids. When it comes to taking care of paperwork, approvals and sign-offs on an awarded bid, what use to take a 2-week timeframe can now be done within 24 hours with Projectmates." — Dave Major, Senior Project Manager of Reading Hospital. The third innovation created by Projectmates is the easy ability to make schedules. Project managers can create different schedules for the various aspects of their projects. Projectmates gives you the ability to manage multiple schedules, decreasing the need to have one massively cumbersome plan and instead lets you choose to have smaller, bite-size schedules that are easy to navigate. 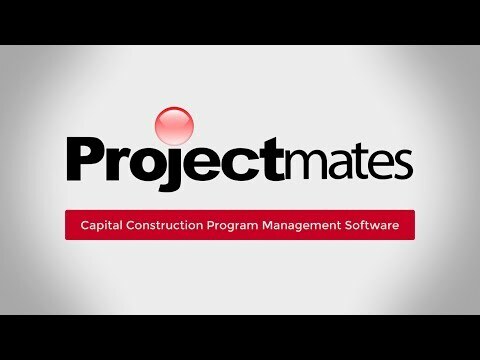 Projectmates Capital Construction Program Management Software functions in any modern web browser, such as Chrome, Firefox, Safari, IE 10 and IE 11. Moreover, with the new & streamlined Projectmates App, construction project team collaboration works seamlessly on a desktop, tablet, and smartphone with the modern responsive design. Our 100% web-based and mobile-friendly platform enables our clients to efficiently manage the entire building process from start to finish on behalf of owners, including developers, corporations, and institutions anywhere at ANY time using ANY device! Projectmates brings you the necessary features to manage your construction project workflow. Do you utilize these processes with your construction project management software? If you have been wondering how to streamline your capital construction projects, efficiency is critical, and we are here to offer a solution.